A look at consoles that can professionally handle a large productions, even if physically they're not all that sizeable. When we talk of “large frame” consoles, older analog units with channel counts of 40 inputs or more come to mind because they actually had very large frames loaded with channel strips. In today’s digital world, however, we’re usually referring to a console that can professionally handle a large production, even if physically it’s not all that sizeable, because most use layers of fader banks to access additional channels and functions like aux sends on faders. 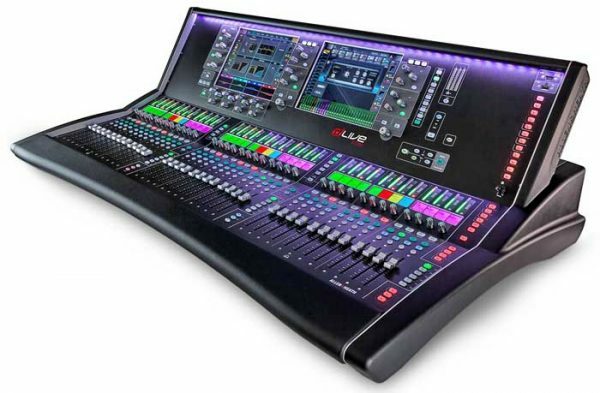 It’s not uncommon to see newer digital models measuring only a few feet in width that can handle 40 or more channels, where in the analog world a 40-input console might be six or more feet wide. Digital consoles have also eliminated the need to carry heavy racks loaded with outboard gear like EQs and effects. Most digital consoles can operate on a network, allowing multiple channels to travel down a small Ethernet, coax or fiber optic cable. Inputs and outputs can be located remotely in stage boxes that are easily linked via lighter cable, eliminating the need for heavy copper analog snakes. In addition, multiple audio devices such as additional consoles and recording units also have easy access to the network. My company also utilizes networked computers for live multitrack recording, archival recordings, and virtual sound check. 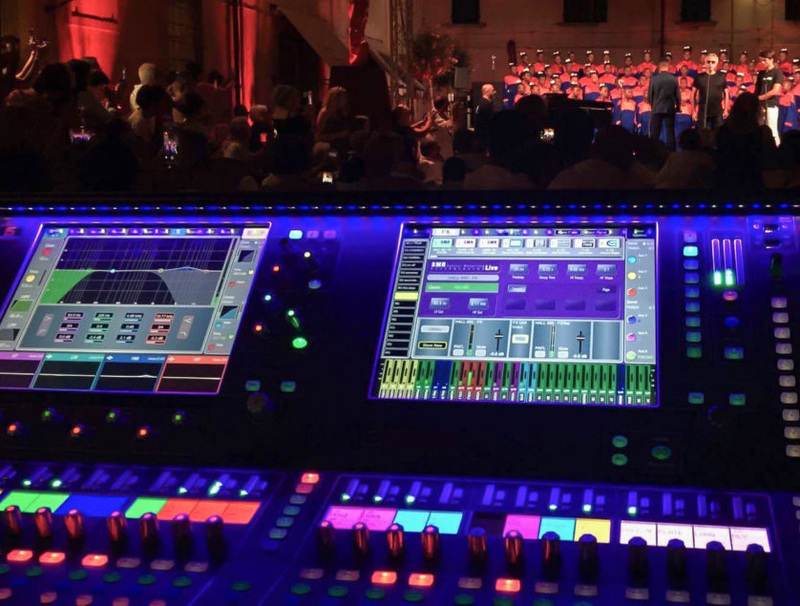 Coupled with the full recall capability of digital consoles, virtual sound check insures that mix engineers don’t have to start from scratch at every gig with the same band, and can “dial in” the band before they even arrive at the venue. Another feature many digital consoles now provide is offline editing, which is the ability to set up and configure the console for a specific act, load the showfile on a thumb drive, and then transfer the settings at a later time to a console. This has been a boon for touring folks can have multiple showfiles for different consoles, and when they get to the venue, simply upload their parameters into the given console without having to spend time labeling, adjust and configuring parameters at every tour stop. My favorite digital console capability is remote access via tablets and laptops. Many models allow engineers to connect via Wi-Fi to remotely control a variety of parameters, allowing them to step away and listen to/adjust the mix in different locations throughout the coverage area. When doing the house mix, it’s great to be able to move around to hear what various sections of the audience are hearing and be able to optimize. It’s also much easier to dial in a monitor mix while standing on stage, hearing what the performers are hearing. Following is a look at a number of recent digital consoles that deliver larger-format capability. While some are not necessarily physically imposing, all have the facilities to handle bigger, more complex events. The Allen & Heath dLive S Class is the ultimate mixing system, with plenty of processing and flexibility to handle the most demanding live scenarios while at the same time giving the engineer intuitive tools to comfortably keep all that power at their fingertips, freeing them to focus on the mixing experience. The power of dLive emanates from the XCVI Core, allowing it to deliver 128 full processing inputs and 16 stereo FX returns, a configurable 64 bus architecture, variable bit depth for ultimate precision and noise performance, a virtually infinite mix headroom thanks to a 96-bit accumulator, and class leading latency at an ultra-low 0.7 ms. DEEP processing architecture embeds class-leading compressors and processing emulations directly within dLive’s input and mix channels. An array of effects, such as graphic EQs and compressor models, can be inserted on the fly without burning FX slots and without the setup, latency and license hassles associated with external plugins. The S Class is at the center of well-developed dLive ecosystem of expanders, apps, software, remote controllers, personal mixers and more, making it easy to create a mix and control system that perfectly mirrors the needs of every installation or show. OF NOTE: The XCVI Core utilizes next-generation FPGA technology to delivers 36 parallel virtual processing cores generating enough power for 160 × 64 channels of processing at 96 kHz sampling rate. Six parallel mixing engines within the Core calculate over 10,000 cross points per sample, while the FPGA router has capacity for 3,000 x 3,000 audio paths.